Israel has used excessive force against Palestinians, Makarim Wibisono, the outgoing UN Special Rapporteur on Human Rights in Gaza and the West Bank said, calling for an investigation. He demanded that all Palestinian prisoners, including children, be charged or released. “The upsurge in violence is a grim reminder of the unsustainable human rights situation in the Occupied Palestinian Territory and the volatile environment it engenders”. Makarim Wibisono has announced he is resigning in protest at the Israeli government’s response to his concerns (his term would have expired on 31 March). The special investigator quoted statistics by the Israeli human rights group B’Tselem, which say that about 5,680 Palestinians, including children, were detained by Israel as of the end of October 2015. Detaining these people “often under secret evidence, and for up to six-month terms that can be renewed indefinitely, is not consistent with international human rights standards,” Wibisono said, adding that the Israeli government “should promptly charge or release all administrative detainees.” Israeli Foreign Ministry spokesman Emmanuel Nahshon branded Wibisono’s report as biased. “The report reflects the one-sidedness of the mandate and its flagrant anti-Israel bias. It is this one-sidedness which has made the rapporteur’s mission impossible to fulfill, hence his resignation,” he said. On 4 February 2016, Awni Abu Shamsiyya and Nizar Silhab Al-tamimi were interrogated by Israeli police and intelligence services before being brought before the military court of Ofer, where the accusations against the young activists of throwing a Molotov cocktail at Israeli soldiers and posting inflammatory statements on social media were presented, and a fine of appr €460 was requested by the military prosecutor. The court ordered Awni Abu Shamsiyya’s release after holding that the accusations against him had not been proven, however, the trial of Nizar Silhab Al-tamimi was postponed to 7 February 2016 after it was claimed by the military prosecutor that his confession had been obtained. 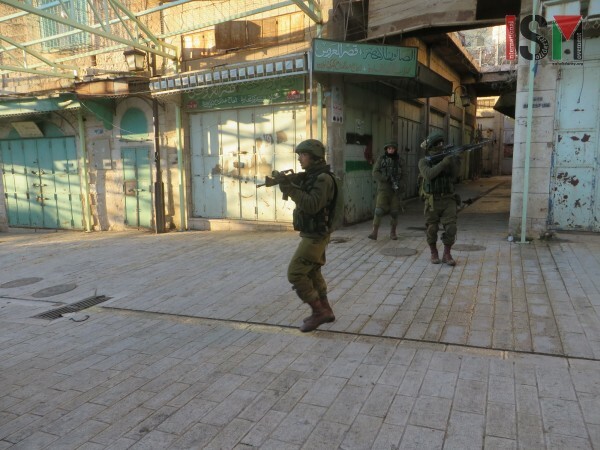 As an illustration of the context in which the violence and arrests occur see the report of Tuesday, 9 February 2016, by the International Solidarity Movement, al-Khalil team (Hebron), which published graphic pictures of Israeli forces patrolling the Palestinian market in occupied al-Khalil (Hebron), harassing and intimidating residents. Any male adult or youth was stopped on their way to work and forced by the Israeli soldiers to lift up their shirts and trouser-pants, as well as throw their IDs on the ground. After throwing their IDs on the ground Israeli soldiers ordered the men to move back, so they could pick up the IDs from a ‘safe distance’. Most Palestinians were dismissed after this humiliating procedure, whereas some of them were detained for minutes or violently body-searched. “Killing Ishteiwi in such a way constitutes an assault on the rule of law and might institutionalize a serious case of extrajudicial execution,” said the Palestinian Centre for Human Rights (PCHR). “Prosecuting collaborators with the Israeli forces is necessary, and the Palestinian armed groups play an important role in such prosecution,” PCHR stated. “However, only official authorities should open investigations and hold the perpetrators to account.” Following news of Mahmoud Ishteiwi’s execution, Buthaina Ishteiwi told the Wattan news outlet that she believed her brother had been killed due to a dispute with his superiors.